A tiny, potent taste of the wild! All blueberries are not alike! By nature, the little wild ones have more intense flavor, deep blue color and 2x the antioxidants than their regular cultivated cousins. 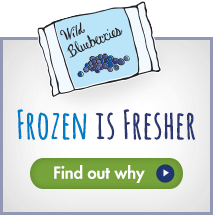 So be sure you’re getting the blueberriest blueberry: Frozen Fresh Wild Blueberries. Wild Blueberries are frozen fresh within 24 hours of harvest, when their flavor and antioxidant goodness are at their peak. In fact, tiny, potent wild ones contain less water than regular blueberries, so they freeze better than ordinary, larger blueberries. They also maintain their shape, color, flavor and nutritional value in cooking and baking. What’s more, their smaller size means twice the berries—and twice the antioxidants—in every bite. Frozen Fresh Wild Blueberries are easy to use right out of the freezer, making them a tasty and convenient way to get your antioxidants! If all else fails, feel the berries in the bag. If they are small and “pea-sized,” chances are you’ve got the wild ones.